Don Willie was appointed Executive Director of the Dixie State University Technology, Innovation and Entrepreneurship Center in April 2018. In these capacities, he also oversees the St. George Business Resource Center located at Dixie State University and The DSU Innovation Plaza – A business launchpad and makerspace. Don holds a Masters Degree in Public Administration from the University of Utah with an emphasis in international management. Don previously served as the Managing Director at the World Trade Center Utah where he oversaw all operations and business outreach for the organization. 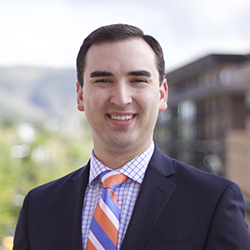 He is the founder and former director of the Emerging Leaders Initiative of Utah and serves as a board member at the Utah Alliance for Economic Development. Don was named a 2017 Utah 20 in their 20’s awardee by Utah Business Magazine and is an advocate for empowering young leaders in the private and public sectors.